This sweet little chair was brought to my by a friend who saw the potential that lay behind the dried out wood and layer of dirt. 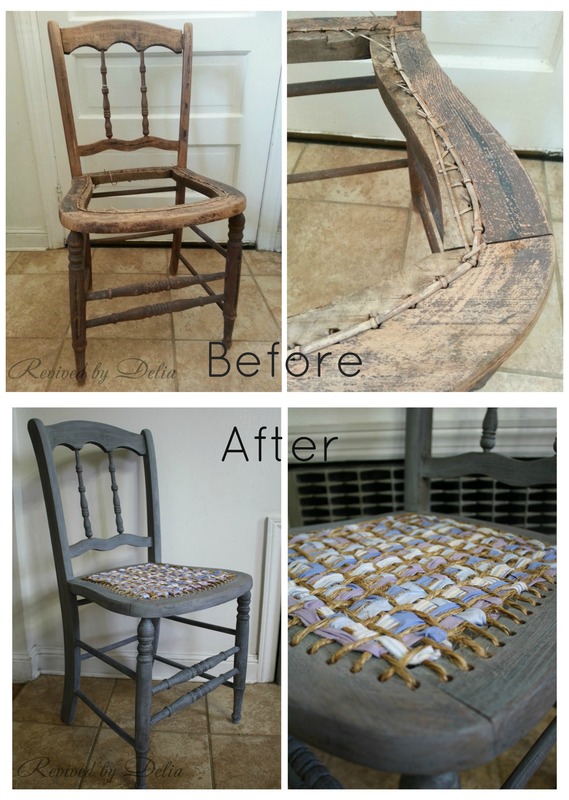 This chair was the definition of why I do this – it was dusty and forgotten and needed a little revival! After a quick cleaning and gluing a few of the joints, I painted the frame in The Old Fashioned Milk Paint Company‘s Slate Grey. Because the wood was so dry, I was sure it would soak in, but thought there might be some chipping where some of the old finish remained. (It didn’t end up chipping at all.) 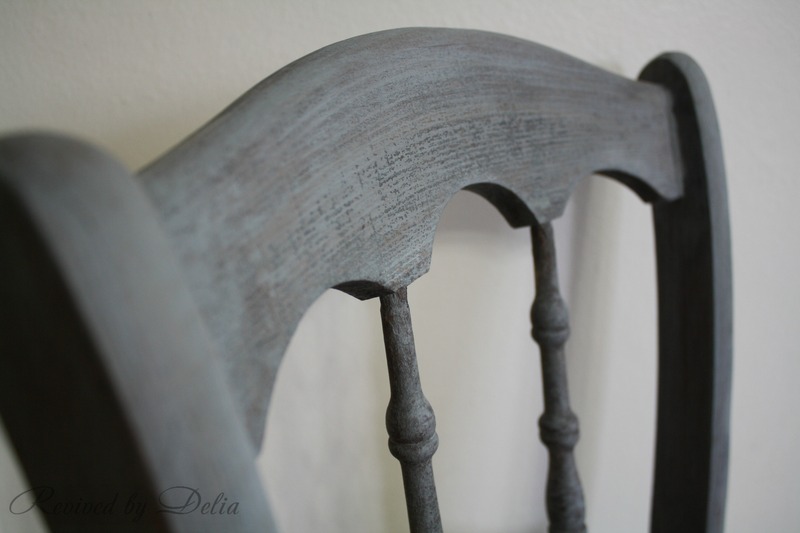 Overall, I was going for the look of a wash, rather than freshly painted, so I mixed my milk paint powder with a bit more water than usual. I painted on about a coat and a half – the “half” being a quick spot-painting areas that looked lighter after the first full coat. Originally I started weaving the rags through the holes, but even doubled up, I just didn’t feel like it was going to hold up. That was a lot of pressure to be putting on my little hand-tied knots! It needed something stronger. I had rope but it was too thick. So I separated the rope and used only one section of the three. Separating the rope was not fun, and it’s definitely easier with a helper. And I would suggest wearing gloves of some sort – the rope is not kind and my hands were quite sore for the better part of two days. Anyway, once the not so fun stuff is out of the way, start weaving… I just did a single layer, simple over-under pattern, stapling the ends under the chair. Once the seat was finished, I had a nice little grid. From there, I took my shirt rags and one at a time, wove them through the grid in a pattern, alternating colors. I left a few inches hanging at the beginning and end so I could knot them underneath later. This part took a while but was so fun to see it forming. 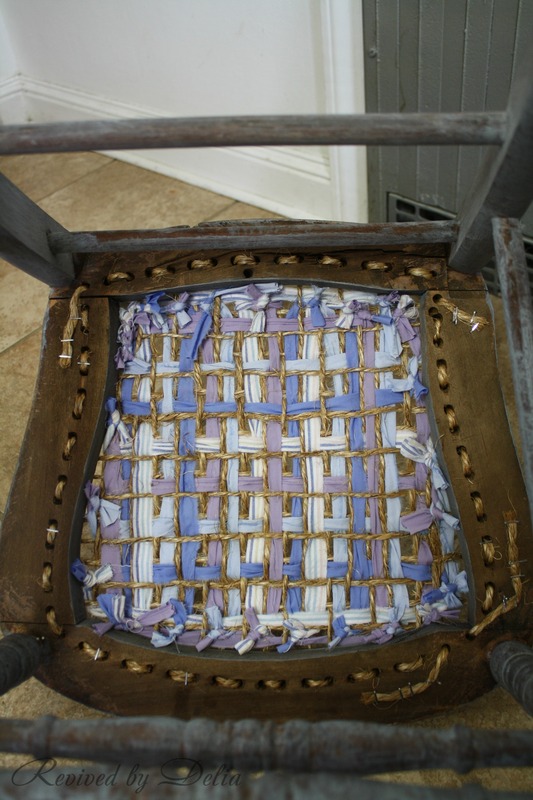 Once the grid was all woven, I flipped the chair over and tied all the loose ends together, then trimmed them down so they didn’t hang. After a quick coat of clear wax, and a brushing of Miss Mustard Seed Antiquing Wax, this sweet little chair was ready for the shop. You can find it at Serendipity. What a clever idea! When I saw it the other day, I didn’t have any idea how you would tackle the missing seat, but this is inspirational. However, I would ask ….. is it comfy to sit on? Hi Judi – it actually is quite comfy and strong. It flexes a smidge when you sit on it, but only as much as would be expected from any chair with a caned seat. I am very happy with the results! Thank you for sharing my excitement! Your chair came out awesome–I love the added color from the shirts! 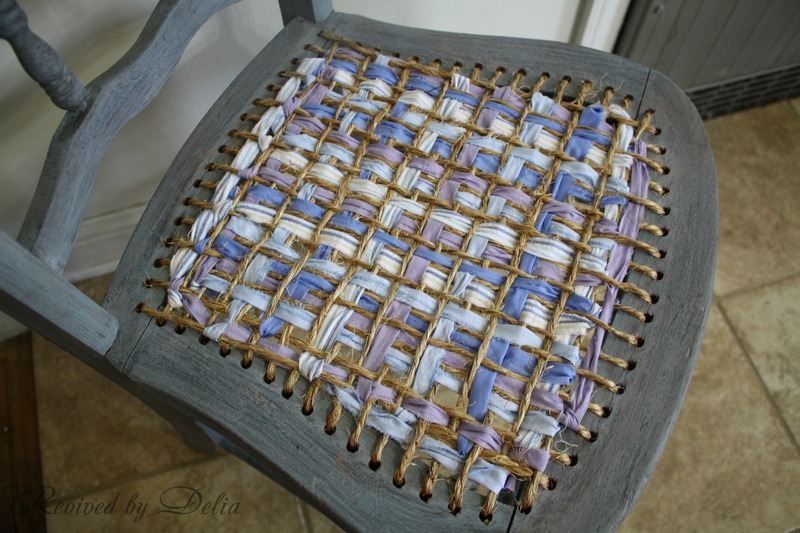 I did the same thing to a broken cane chair too, but I used jute so I didn’t have to split the rope apart–the just was the perfect size for the cane holes. That is great! I was thinking of jute but the only roll I had was pretty thin and I didn’t think mine would hold up. If I had thicker jute I would have opted for that as well. Your chair (and desk) are so sweet! I really contemplated stopping at that point but wanted it to be more girlie to go with her spindles! Thanks for sharing and stopping by! What a transformation! 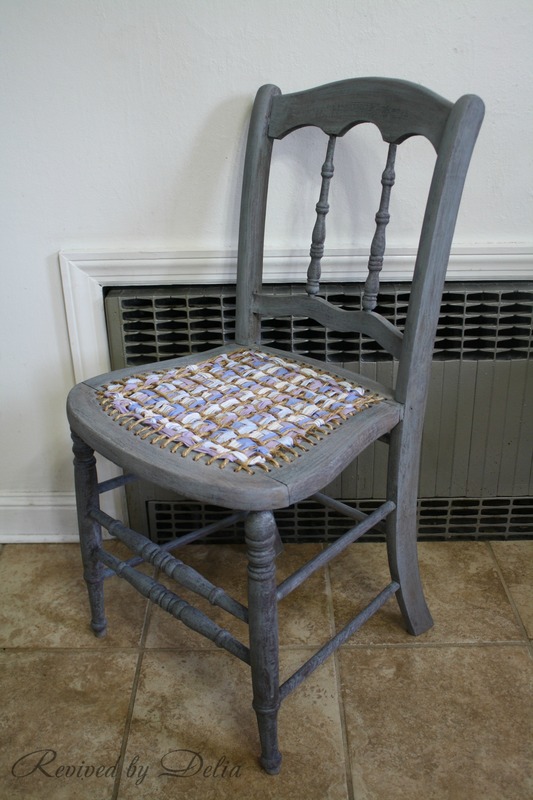 This chair is so beautiful now……and usable! I like that! And I love that you used thrift store shirts for it…..awesome! What a fun and adorable idea. I have a chair just like this and I would love to give this a try. Thanks so much for the tutorial! Thanks Terry – if you do, come back and share how it came out! It’s awesome Delia, I love it! And I am super impressed with your cleverness. Great makeover. Thank you Melanie – I’m looking forward to seeing your French Chair reveal! You seriously amaze me, Delia! Beautiful job, and so very clever. Pinned! What a cool idea! I have never seen that. 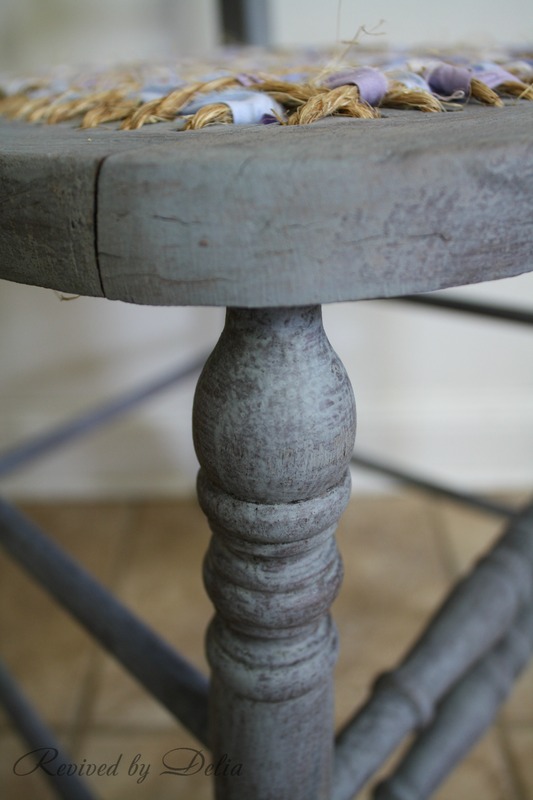 Your combo of colors, material and milk paint, are stunning! Love!! 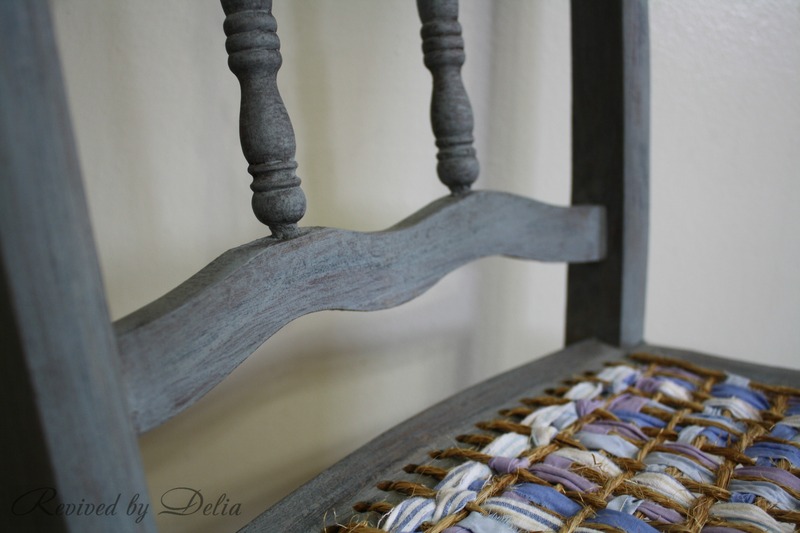 I love the color and the rag seat-great transformation! Thank you Darrielle – I was just over at your blog and love your blue curvy dresser! Beautiful! Found you through Jenn Rizzo’s link party. I love the creativity you used on the chair! So sweet! Thank you so much for stopping by and leaving your thoughts! This is unique and gorgeous! This is gorgeous and beautiful! Now I need to go find a chair to do this to! Thanks so much for coming by and for the invite – I linked up and have followed you on FB/Twitter. This is lovely and such a unique idea. That’s a creative idea. Thanks for sharing. Beautiful chair. So unique. I have never seen one done like this. I would love for you to share on my Chic By You Link Party @ http://chicbytab.blogspot.ca/2014/03/chic-by-you-wednesday-link-party-2.html. Hope to see you there! Thank you Tabatha! I linked up, thank you for the invite! Thank you for stopping by and commenting – so glad you like it! Wow!! Love it…the colors are yummy! I would love it if you would come join us for Centerpiece Wednesday on my blog and share your creativity with us. http://thestylesisters.blogspot.com/2014/03/centerpiece-wednesday-115-see-and-share.html Hope you will come and party with us. Thanks so much Karin! I linked up – thank you for the invite! Thanks so much for the feature! I’m glad you liked it! See you next week – maybe I’ll have had some time to get something else done! 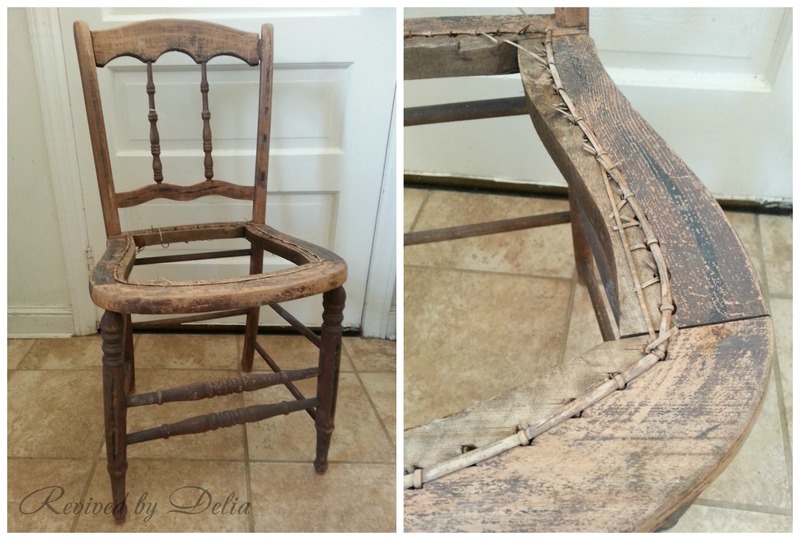 My great aunt redid a chair bottom, much in the same way, using her father’s old neck ties! My sister still has that chair!! What a great idea and memento! If you have a picture of it, I would love to see it! I LOVE this! 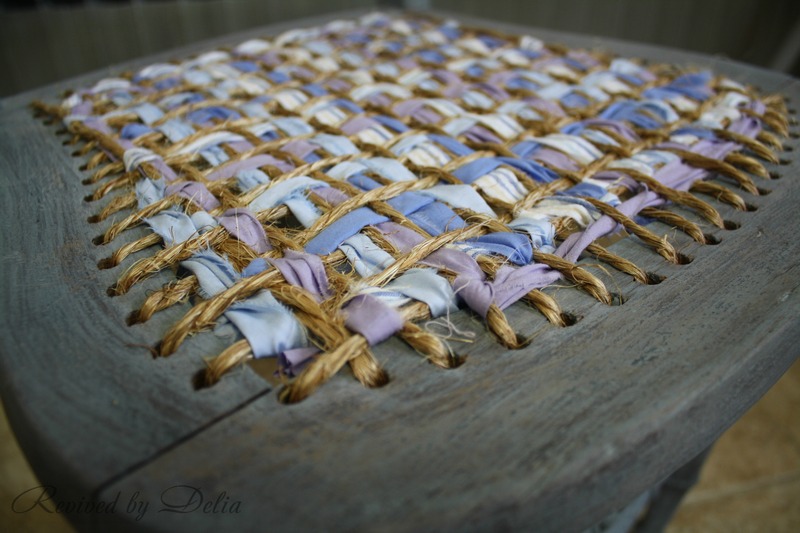 What a fantastic idea to weave material and jute together! It looks reallly great! That is a very sweet chair, I love it! !